The weather is finally nice and perfect for a picnic! 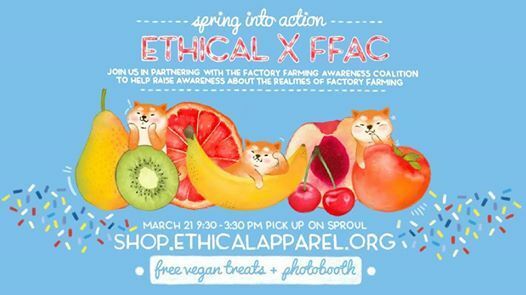 Come by our "picnic" table this Thursday for our sales event partnered with the Factory Farming Awareness Coalition. We'll have samples of vegan food and a photo booth set up just for the occasion. If you buy our Wine Up, Poppies, CA Animals or Redwood shirt, you will get a free sticker! The free stickers we will be handing out are our Bearly Awake, Great Waves of Exams, Lotus Meditation Bear and Battery stickers. Drop by our table on Sproul from 9:30 AM to 3:30 PM this Thursday, March 21st to pick up your pre-orders and learn more about food sustainability and enjoy some samples. We are now fully transitioned to pre-orders. 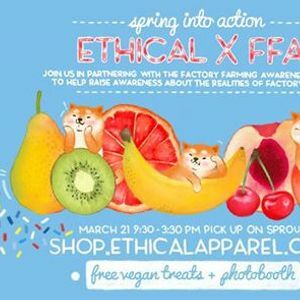 If you would like to purchase any of our items, please do so at shop.ethicalapparel.org before 3/20 11:59pm to pick up this Thursday! In general, order online on Wednesdays by 11:59pm to pick up your pre-orders at our table on the next day Thursday on Sproul Plaza! EthiCAL Apparel is a student-run social enterprise at UC Berkeley. We sell student designed clothing, stickers, and accessories on campus and provide design services for custom apparel for organizations across the nation. We loan out, invest, and donate our profits to entrepreneurs around the world. This semester, we’re directing profits towards efforts to make the textile industry healthier for laborers and more sustainable. Part of our line of apparel on campus is made with organic cotton by a Fair Trade certified manufacturer. Thanks for supporting our designers and the work that we do!